A beautifully appointed, comprehensively updated and improved End Town House, the largest design of Town House on this exceptionally popular Development, positioned within walking distance of both Hale Village with its fashionable shops, eateries and bars and Altrincham Town Centre, its facilities, the popular Market Quarter and the Metrolink. 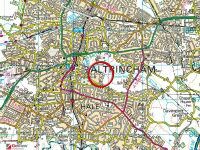 The property sits close to a wildlife corridor bordering onto Altrincham Golf Course and King George V pool creating a most appealing setting. Recently upgraded with a remodelled Kitchen and En Suite Bathroom and the property is literally ready to move into with the minimum of fuss. There are two good Reception Rooms with the First Floor Lounge enjoying a delightful Sun Terrace feature, a fabulous 325sqft Open Plan Live In Dining Kitchen with bi-fold doors onto the Garden and a useful Utility Room. 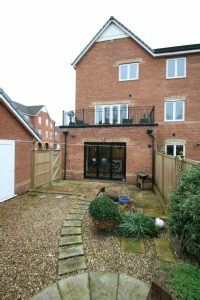 Over the Two Upper Floors are Four Bedrooms served by Two full Bathroom facilities and with Two Bedrooms having extensive built in wardrobes. 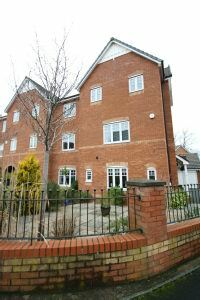 There is ample off street Parking, a Detached Single Garage and lovely low maintenance landscaped Gardens. Hall, setting the theme for the immaculate presentation throughout the property with two windows to the front, modern wood finish flooring which continues throughout the Ground Floor and a spindle balustrade staircase rising through the floors with under stairs cloaks and storage beneath. 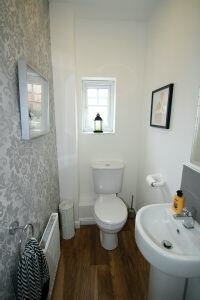 Ground Floor WC well appointed with a white suite and chrome fittings of WC and wash hand basin. Window to the front. Dining Room with two windows overlooking the front Garden. 325sqft Live In Dining Kitchen, a fabulous room, having been comprehensively upgraded, featuring bi-fold doors giving access to and enjoying an aspect of the Garden and with a further window to the side. The Kitchen has distinct Living, Dining and Working Kitchen Areas and is fitted with a range of high gloss laminate fronted units with Quartz worktops over arranged around a central island unit, incorporating a breakfast bar. Integrated appliances by Neff, AEG and Electrolux include a stainless steel fan assisted double oven, four ring induction hob inset into the island unit with globe extractor fan over, integrated fridge, freezer, dishwasher and wine cooler. Wet Bar Area with wiring for wall mounted flat screen TV above. Custom LED light fittings to the ceiling. Cupboard housing the gas fired central heating boiler. Door to the Utility Room fitted with a range of matching units with worktops, sink unit, space for a washing machine and dryer and extensive storage. First Floor Landing with windows to the side and a continuation of the staircase to the Second Floor. First Floor Lounge, a delightful Reception Room with modern wood finish flooring. Window to the side and featuring French doors with side windows giving access to a decked Sun Terrace, enclosed with wrought iron railings. Principal Bedroom One with a window to the front, modern wood finish flooring and with wall to wall, floor to ceiling mirror fronted sliding door wardrobes. This Bedroom is served by the stylish En Suite Bathroom, refitted with a white suite and chrome fittings, providing a corner spa bath, vanity unit circular bowl wash hand basin, WC and corner shower cubicle with thermostatic shower and drench shower head. Extensive tiling to the walls and floor. Chrome ladder radiator. Toiletry cupboards. LED lighting. Second Floor Landing with three windows to the side elevation and doors to the further Bedroom and Bathroom accommodation. Bedroom Two with a window to the rear. 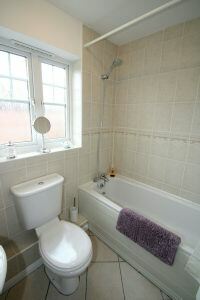 Modern built in wardrobes and a cupboard housing the comprehensive hot water system. Bedroom Three with a window to the front. Bedroom Four with a window to the side. These Bedrooms are served by the Family Bathroom fitted with a modern white suite with chrome fittings, providing a bath with mixer shower over, wash hand basin and WC. Extensive tiling to the wall and floor. Window to the front. 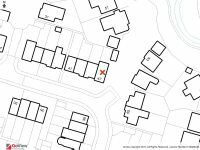 Externally, the property is approached via a Driveway providing good off street Parking and in turn leads to the Detached brick built Garage, with up and over door. The Garden to the front of the property has been paved for ease of maintenance, retained within dwarf walling. The Garden to the rear has also been designed with low maintenance in mind, laid to paved path, patio and gravelled areas, with maturely stocked borders, enclosed within timber fencing. There is a further circular patio to one corner of the Garden designed to maximise the South and West facing sun. 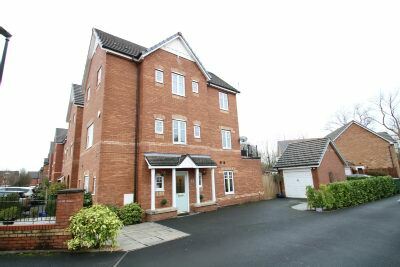 This really is a first class example of the largest Town House type on this exceptionally popular Development. The property details listed on this Web Site are subject to almost constant change and update. 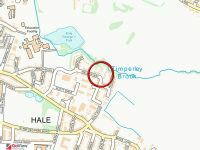 For the very latest information on the property seen on this site, please contact us immediately regarding the property you are interested in. For clarification, we wish to inform prospective purchasers that we have listed the details of these properties as a general guide. 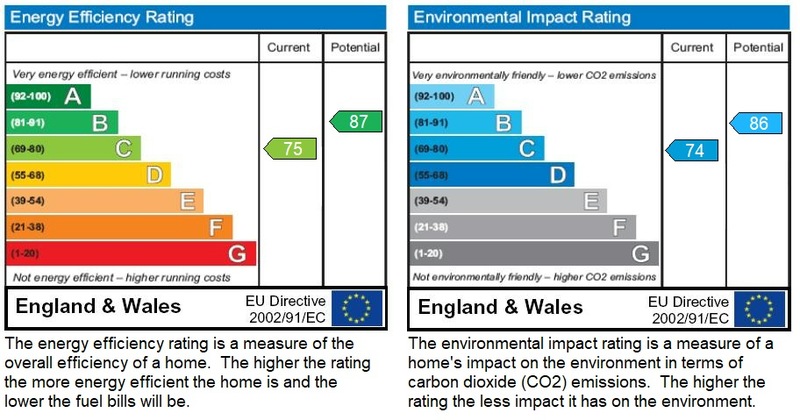 We have not carried out a detailed survey nor tested the services, appliances or specific fittings. Room sizes should not be relied upon for carpets and furnishings.